These documents are available in an alternate format or translated upon request. Please contact the department listed below. Spanish: Este documento se encuentra disponible en un formato alternativo o traducido según solicitud. Russian: По запросу этот документ доступен в альтернативном формате или в другом языке. Korean: 본 문서는 다른 형식으로도 제공되며, 요청 시 번역도 해 드립니다. MTA MobilityLink Office ● 410-764-8181 ● 866-743-3682 ● TTY 410-539-3497 ● Maryland Relay 7-1-1. This Media Guide was compiled in an effort to provide basic information about the MDOT MTA to news organizations and others, and to facilitate an effective relationship with the Office of Communications & Marketing as a whole. Know before you go. Our Snow Guide will provide you with all the means necessary to stay informed of alerts and advisories due to inclement winter weather. 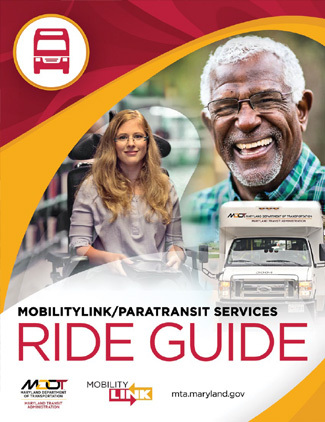 This guide provides helpful information on all aspects of MDOT MTA's MobilityLink services. If you have questions about the service, please call 410-764-8181 and select Option 8 for Customer Service assistance. 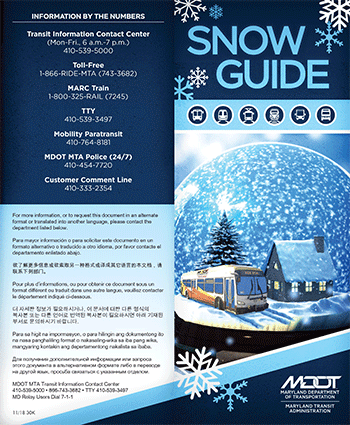 On Your MARC is our official passenger publication for those who wish to learn more about MARC Train service. Each issue contains timely news and features about MARC Train service, stations and equipment, current and future projects, outreach events and service changes. MTA newsletters are automatically sent to subscribers to our eAlert system, which allows you to receive email and text message alerts for all MTA service modes. Sign up [here] and choose which messages you would like to receive.